Added Fennel bulb to Vegetable stock instead of using chix stock. Ground Fennel seeds and cayenne pepper were added too. Served with Sauteed Mushroom (with Smoked Paprika) Gruyere Crouton and Sauteed Baby Fennel that had first been blanched and then sauteed. Substituting orecchiette for the gnocchi yields a dish that is still yummy and relatively quick to prepare. The prunes are wonderful and a great side to go with the white sausages, which we made ourselves! Classic combination, The prunes are a very nice touch. From two acclaimed, award-winning restaurants came two of the most acclaimed, award-winning cookbooks ever published - now packaged together in a luxurious slipcased boxed set, the ideal gift for any food lover. First there was French Laundry in Napa Valley, setting a new standard for American fine dining. Then there was The French Laundry Cookbook, setting a new standard for American cookbooks. 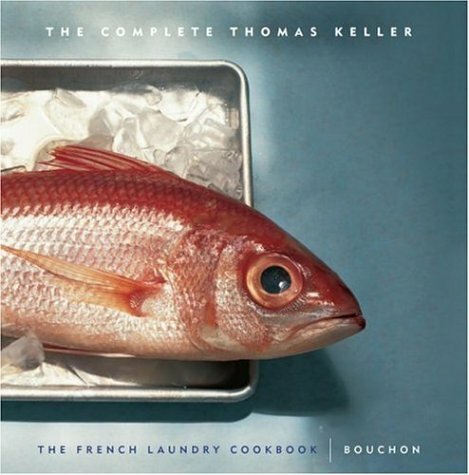 In 1998, Chef Keller opened Bouchon, "so that I'd have a place to eat after cooking all night at the French Laundry," and that restaurant, too, gave birth to a groundbreaking cookbook. Now, fifteen years after Thomas Keller first set foot in what would become a landmark restaurant, these two extraordinary books are offered in a striking new slipcased edition. With this year's opening of the Bouchon Bakery in New York City, and last year's momentous Michelin guide that awarded Keller's Per Se the top honors, Keller is increasingly in the limelight - and his inventive, delicious food is increasingly in the consciousness of a national audience. The Complete Keller is the perfect gift for anyone who loves fine food. Thomas Keller became chef/owner of the French Laundry in Yountville, California, in 1994. In 1998, Keller opened the casual bistro called Bouchon. In 2004, he opened Per Se in New York City. In late 2005, Per Se became one of only four restaurants in Manhattan to receive the much-coveted three stars from the Michelin Guide.